John Edward Page, born February 25, 1799, in Trenton Township, New York, was a member of the Methodist faith before being baptized a member of The Church of Jesus Christ of Latter-day Saints in 1833. He was called on a mission to Canada in 1836, but was so poor that he was wary about accepting the call. The Prophet Joseph Smith took off his coat and gave it to John, promising him that if he would go and work hard, he would be blessed. John baptized 305 people during that mission. He returned home briefly only to gather his family and return again to the same region to continue preaching the Gospel. After two more years of serving his mission, he had baptized nearly 600 more people. 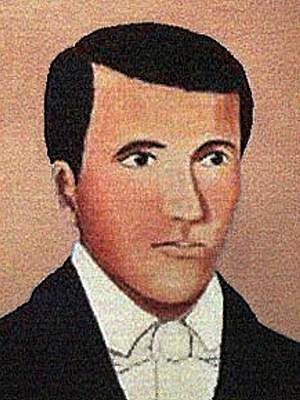 At the conclusion of his Canadian mission in 1838, John led the main body of his converts to join the Saints in Missouri. They arrived during the period of vicious attacks against Mormon cities in Missouri, and John’s wife and two daughters were martyred in DeWitt. Shortly after this, John was called to be an Apostle and given the assignment to serve a mission to England. He failed to go on that mission. He was called again to serve a mission in 1840, with Orson Hyde, to dedicate Palestine for the gathering of the Jews. He started on the mission, but never made it out of the country. Following the martyrdom of Joseph and Hyrum Smith in 1844, John returned to Nauvoo and maintained that his testimony was still strong and his desire to preach still intact. However, he was dissatisfied that his preaching did not bring him money to sustain his family, and his name was absent from Church records by 1845. He briefly supported James J. Strang as the rightful follower of Joseph Smith and attempted to persuade the Canadian Saints whom he had baptized to follow him. This, along with his continued absence from church councils, resulted in his excommunication from the Church and the loss of his apostolic authority on June 26, 1846. He then joined with Strang’s congregation and was ordained an apostle in that church, where his main ministerial theme was that the responsibility of supporting those that were preaching fell upon the shoulders of the congregation. His affiliation with Strang’s church lasted only until 1849. Following that, he joined briefly with three other break-offs of Mormonism: the Brewsterites, a small branch in Illinois, and finally the Hedrickites. Page was instrumental in gaining the Independence temple lot for that break-off branch. Page died at home on October, 1867, in Sycamore, Illinois, at the age of 68. Susan Easton Black, Who’s Who in the Doctrine & Covenants, pg. 210-213. This page was last edited on 6 September 2012, at 09:50.